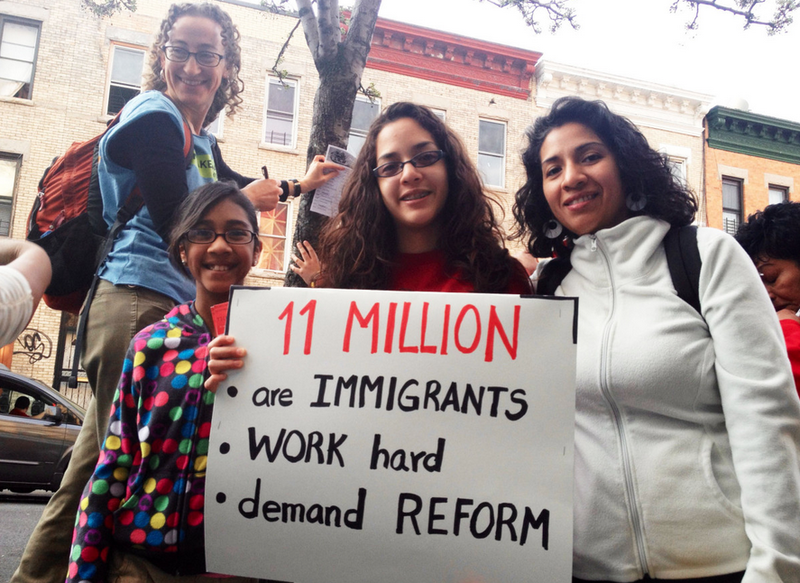 Nicole Sanchez,16, pictured center, holds a poster she took with her to Washington D.C. for rallies in favor of a path to citizenship for 11 million undocumented immigrants living in the U.S. She joined nearly 500 others who travels in buses with Make the Road New York immigration advocacy members. The Brooklyn Ink. Sixteen-year old Nicole Sanchez carried a sign that read, “11 million are immigrants, work hard, demand reform,” as she and her sister, Christine, and their mother waited for a bus in Bushwick, Brooklyn early Wednesday morning. They were headed to Washington, D.C. to participate in a rally to support immigration reform. She and her sibling are not undocumented, but their mother, Anita Astupuma, 38, who spoke interchangeably in English and Spanish, is. Sanchez was one of 500 immigration reform advocates who boarded 10 buses Wednesday to head to Washington for a series of rallies to support a path to citizenship for 11 million undocumented immigrants living in the U.S. The New York office of Make the Road, an immigrants’ rights advocacy group, organized the trip. The group joined thousands of others outside the U.S. Capitol on Wednesday afternoon hoping to create a sense of momentum after a presidential election that proved the growing influence of Hispanic voters. Organizers hope Congress will pass comprehensive immigration reform to eliminate the rise in separation of families caused by deportations. In fiscal year 2012, the Obama administration deported a total of 400,000 people, the nation’s record. A bipartisan group of senators, known as the “Gang of Eight,” is finalizing an agreement to overhaul the country’s immigration law for the first time since Ronald Reagan was president in 1986. The comprehensive proposal should be publicly announced next week and it is slated to reach the Senate floor next month. The challenge is for the proposal to successfully pass through a Republican-controlled House. Luevanos, 29, donned a light blue shirt that had letters printed in black across the back that read, “Respeto y Dignidad,” Spanish for “Respect and Dignity.” Luevanos immigrated alongside his parents to Los Angeles when he was 4 years old. Through family member ties he became a resident at age 10 and in 2008 he became a citizen. He received a graduate degree from New York University in 2010. “We’re in demand of a comprehensive immigration reform that is inclusive within all the immigrant communities, including workers, LGBT people, the youth – everyone that has immigrated who demands to be heard,” said Luevanos. One of the leaders of Workplace Justice Project at Make the Road New York, Augusto Fernandez, a Brooklynite who is originally from Ecuador, has been waiting for his legal documents to be processed for the last 12 years. The pathway to citizenship for the 11 million immigrants already living here under the bipartisan senators’ plan is a wait of at least 13 years. Fernandez, who works in maintenance in Manhattan, has applied through his brother who was already a citizen when Fernandez first moved to Brooklyn. The bipartisan proposal has several components, including separate programs for high-skilled workers and farmers. A major part of the plan calls for those who are living in the U.S. illegally to line up behind immigrants who are already in the system to gain residency or citizenship. Other requirements of the plan ask for immigrants who have worked in the U.S. for 10 years to learn English before applying for citizenship. As they boarded the bus on Wednesday, Nicole Sanchez, a junior in high school and a member of the International Model United Nations Association, and her mother, a native of Peru, had high hopes that an immigration reform bill will pass. Sanchez’s mother hopes she will be able to stop living in fear of being separated from her daughters, will become eligible for a driver’s license and be able to help her elder daughter attend college.